Spinal decompression is an excellent treatment for disc injuries and various forms of neck pain and back pain, but doing spinal decompression by itself is not nearly as effective as using spinal decompression in conjunction with other treatments. That is why we use spinal decompression in conjunction with chiropractic care, spinal remolding techniques, stretching and strengthening, and the first FDA-approved cold laser, called the MicroLight 830. The MicroLight has been all over the news for it's pain relief ability. Cold laser is a sterile, painless, non-surgical, drug-free way to encourage healing in an injured area, and there are no known side-effects. 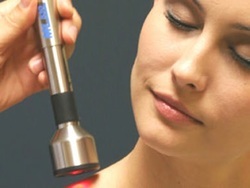 The cold laser was fist approved by the FDA after a carpal study was performed with the MicroLight Laser on workers at Ford Motor Company. If you have a cold laser story, please share it! Low Back Pain and neck pain are the most common forms of back pain. Most low back pain is caused by overuse and injury, but lifestyle can play a huge factor in low back pain. Consider this: If you sleep approximately 8 hours a night, given commuting, eating, tv watching, and desk work, you may sit 91% of your day, which over time reduces and even eliminates your natural low back curve, due to the remolding of the spine and its "plastic" quality. This amount of sitting puts a great deal of pressure on the discs of the spine and over time can compress the disc and reduce the natural space between the vertebra of the low back. On top of this, the disc of the spine do not receive blood flow, so they get nutrients by movement of the spine itself. This is why healthy movement is so important. A lot of low back pain is manageable and even preventable by simply walking and moving healthfully throughout your day. If sit all day long, and drive long distance, then you will likely have to interrupt your day with a wonderful walk, if you'd like to manage your lifestyle-induced low back pain. While out for a walk, stop and reach to the sky and breath deeply. This simple movement can help. If this doesn't work for you, then call. You likely have something else going on that needs some attention. Low back pain can be caused by muscular tension, disc degeneration, herniated discs, disjointed vertebra, kidney pain, osteoporosis, arthritis, and more. Let's get you checked out and determine what is going on. Simple, natural, non-surgical, drug-free, and affordable treatments like chiropractic care and spinal decompression are proven to offer fast-acting pain relief. We are located in Colorado Springs and one of the things we treat really, really well is low back pain. After researching spinal decompression tables for the past 6 months and interviewing spinal decompression doctors and manufacturing companies, we, at the Back Pain Institute, have finally made a decision...and no it is not for the DRX9000 table that is ever-so popular. We chose the most advanced table in the world - a dramatic improvement from the flat tables of 2005 - the Kennedy spinal decompression table. The Kennedy table can invert in the middle either up or down, it treats both the cervical and lumbar spine (neck and lower back), it uses vibration technology, and can place the patient in many different positions, allowing the doctor to utilize angular traction. One of the greatest differences between our spinal decompression service and others is that our doctors are certified in the technique and the table. Few certification courses have ever existed that are accredited and contribute to doctors continuing education. The Kennedy decompression certification is an invaluable asset. We decided against the DRX9000, though it sure looks fancy and has a built in tv and CD player, because of the allegations and charges of teaching insurance fraud and false advertising, and the 2007 FBI raid in Tampa, FL of the Axiom headquarters. If you are interested in taking us up on our offer, be sure to bring any MRI you may have, any paperwork regarding your condition, and an X-rays you may have. The State of Colorado does not allow us to give you free X-rays, so if that is necessary, the cost is $150; however, insurance will, in many cases, pay for X-rays and an MRI through your medical doctor. This depends on the insurance and your plan. Bring your card in and we can verify your insurance benefits for you. We are currently take orders on a waiting list status for February 15, 2012.